days, but this was ridiculous. I asked for another inch. In case you didn't visit here the other day, Curly's Irish dancing dress needed to be let down before she dances at World Championships Ap;ril 14th. He emailed me back. ‘Sure send it over.’ I consulted with Curly’s dance teacher as to whether or not there was a specific carrier I should use, or just the United States post office. She texted back that the post office was fine. It cost me $75 to mail it priority on March 5th. Ouch. Almost two weeks later, I typed in the tracking numbers to see if it had been delivered. It showed that they tried to deliver the dress on March 17th. A Sunday. St. Patrick's Day, no less! What? No further attempts had been made even though at this point it was Thursday. Huh? We do love this dress! I emailed DG. That is when he shared that he was not going to be attending World Championships in North Carolina this year. (Last year it was in Scotland - remember? I am so embracing the almost 'local' venue this year). He also pointed out that the postal service wanted 160 pounds to get the dress thru customs. Guess how many tines in the last 10 years I have felt like Irish dancing is the most expensive activity known to man? 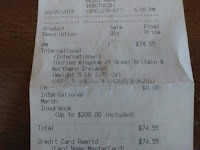 No one mentioned expensive customs fees when I considered my alteration options. That made no sense. He asked me to contact my post office and see where the dress was. The minute the post office opened, I was on the phone. They were nice, but they admitted that they couldn’t do much once the dress was in the UK. Um, what? They agreed to send an email. Then this postal worker read a statement that said the UK would respond within 30 days, she assured me -as she sensed my growing hysteria, that the 30 day part was a policy. We would undoubtedly hear before that. I was shaking. I sent a few more emails to DG in the UK. I carbon copied Curly’s teacher on every email. Secret message implied: 'Hey, DG - if you want one of my fellow dancing friends to buy a dress from you, you better sit up and pay attention. Damn it.' I asked him to kindly get in touch with the postal service on his end, because my post office suggested that this would be the solution. All this was taking place while I was on spring break, um, 'relaxing.' I didn't dare tell Curly. 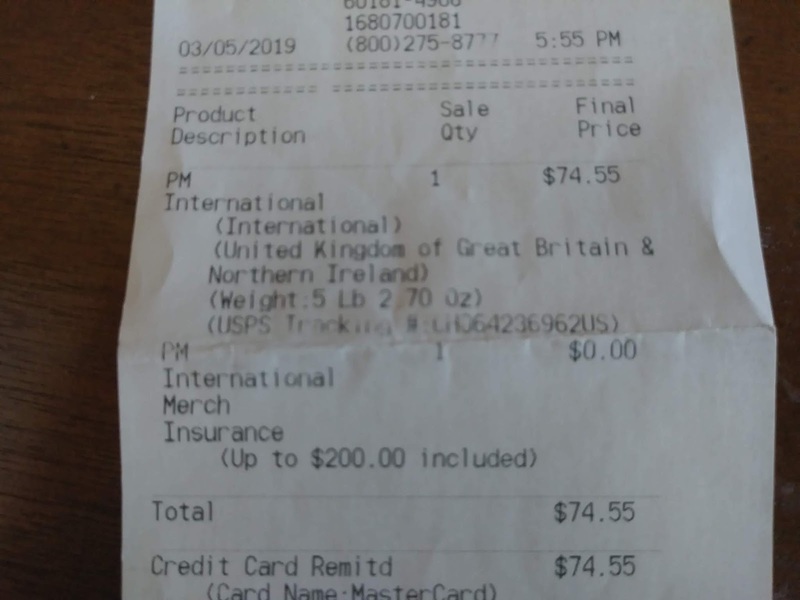 this receipt from March 3rd! He finally admitted that the dress was held up because they were waiting for the customs fees to be paid. Well, what the HELL!? Our window of time for the dress to be fixed and on hand before Curly wears it on April 14th shrunk when I learned that DG is not flying in to Greensboro with it (yes, Beth and Gigi - World Championships are being held in Greensboro this year). He now needs time to repair it, and ship it back. Pay the flipping fees and get your hands on the dress DG! He was apparently worried that he was going to be stuck with the customs bill. Do I dare point out that had he created the dress to fit her right the first time, neither of us would be footing the bill for this customs nonsense or freight?! What I did point out to him was that no one had requested the money from me. I had no link. My pay-pal request. I would not know where to begin to send the money. Pay for it, damn it. I will get you the money, because if there is one thing I have learned about Irish dancing - money is no object. Hard to believe that I have been involved in this mess for over 10 years. Luck of the Irish, my foot. The dress arrived on Tuesday April 2nd altered perfectly. We leave to drive to NC on the 12th. It is as if the magic of leprechaun gold is sprinkled on me causing me to forgive all the stress and patiently await the ridiculous bill. Silly Coach. I have apparently been drinking the Kool-Aid for years. Your posts always stress me out! How do you live through all of this!?!?! I hope that the championships are going well for Curly. I also hope the weather holds out today. It sounds like there is a potential for some really bad storms this afternoon! I wonder the same thing sometimes! While at championships I met another mom of a dancer (translation: we are NOT dance moms), who said she wished the girls xould dance in black leotard and skirt. Amen! She also said with some of the nonsense she sometimes wonders how she got involved in this. Again, amen! Driving back from NC now. Crazy weather yesterday, but as a man sitting near us stated: This is how you know God is on our side. The storms are going around Greensboro. CRAZY!